This isn't exactly the most healthiest recipe, but I thought I would share it anyways so I can save it with all my other recipes online. This is a quick and easy dessert to whip up that I found in the Taste of Home Simple and Delicious magazine. Very delicious! It has a rich chocolate flavor that melts in your mouth! This is sure to please any company you may have coming for dessert! The coffee really brings out the flavor so do not skimp on it. The original recipe called for an unbaked pie crust which you need to bake and then add the filling. 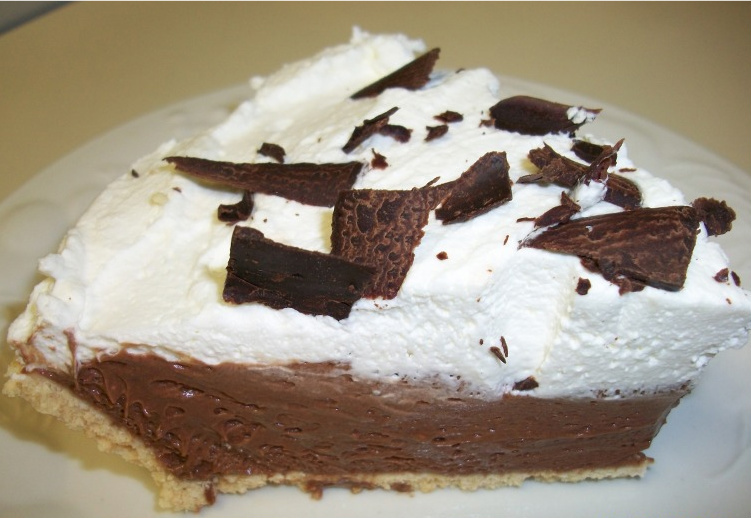 Save time and use a store bought graham cracker or shortbread crust. I love the shortbread crust for this particular recipe. Enjoy! In a heavy saucepan, combine the marshmallow creme, chocolate chips, butter, unsweetened chocolate and coffee; cook and stir over low heat until chocolate is melted and mixture is smooth. Cool. Fold in whipped cream; pour into crust. Chill for at least 2 hours before adding the topping. For topping, in a large bowl, beat cream until it begins to thicken. Add confectioners' sugar; beat until stiff peaks form. Spread over filling. Refrigerate for at least 1 hour before serving. Garnish with chocolate curls if desired. Yield: 6-8 servings.